HONDA: Access to immobilizer, rekey and install new or used PCM's functions; Access to ABS, AIRBAG, all systems diagnose, reflash software included for PCM updates; Access to all other cars 1996 and newer. - ALLSCANENR VCX is compatible with the software of HONDA GNA600, TOYOTA/LEXUS TECHSTREAM very well. - Can realise all the functions of that of Honda GNA600, TOYOTA/LEXUS TECHSTREAM DICE original tools can supply. - Software can be installed in any PC, laptop and PDA. - Communication port flexibly, less connectors support almost all vehicles socket. Got exactly what was described with all functions as stated. 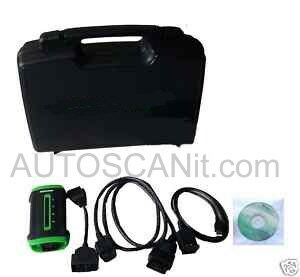 Original German made BMW GT1 Scanner set.